Did you ever wish you could go to an event and meet everyone in the room? Networking @ Noon is a monthly lunch meeting hosted by one of our members in the restaurant industry. This event allows attendees to meet and hear about fellow members' backgrounds and businesses. After a short period of open networking, each attendee introduces him/herself and his/her business with a two-minute "elevator pitch." Each month, two attendees are randomly selected to give a longer presentation at the following meeting. 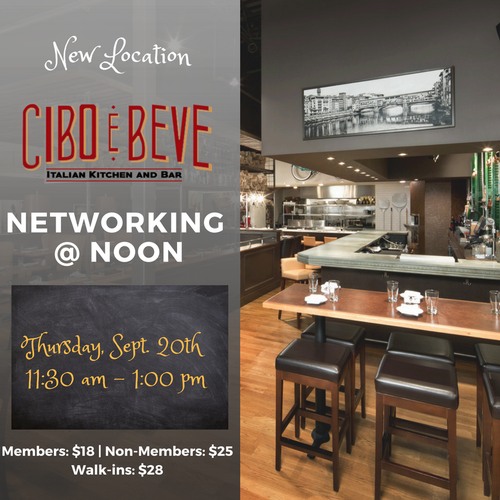 Networking @ Noon is a wonderful opportunity to enjoy a friendly and laid-back setting and walk away with new connections! Join us for lunch, bring plenty of business cards, present your business, and grow your business community! *No refunds will be given for no-shows nor cancelations.